Hackers and scammers have been extremely harsh on companies — readily exploiting any vulnerability they can with threats ranging from phishing to malware to DDoS and many more. So not surprisingly, 73% of attacks against organizations in 2017 were perpetrated by malicious outsiders. Of course, CEOs around the world are anxious. In fact, 40% of them report being extremely concerned about cyber threats. And they feel compelled to take actions by improving their security processes and policies, training their employees, and leveling up their tech stack. But to do that effectively and prioritize their resources, businesses and other entities need to know what they are really up against. 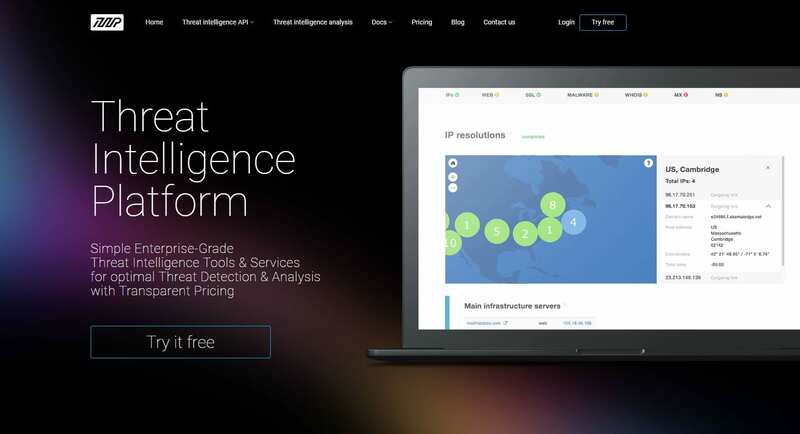 That is where a solution like Threat Intelligence Platform (TIP) can help anticipate hackers’ thoughts and moves by flagging the weak spots of websites, email servers, and other IT systems in addition to unmasking scammers. This post takes a closer look at why threat intelligence is relevant and how it works in practice. In a nutshell, threat intelligence is about gathering and interpreting evidence-based data regarding one’s cybersecurity state to mitigate and prevent existing and upcoming threats. It supports decision-making and identifies where IT security budgets are most likely to be best allocated. As such, threat intelligence applies to a variety of contexts, even though it may sometimes be subject to several pitfalls. Small and middle-sized businesses often overlook the importance of cybersecurity since they perceive that cybercriminals only care for the big fishes. This is not true, however. A recent report by the Ponemon Institute shows that 61% of small businesses were targeted over a period of 12 months. SMEs are attractive victims because they typically have fewer means to fight back — making it even more crucial to make wise decisions about where to spend money. Hackers and scammers are in for easy gains. So why would they attack organizations where defenses are the strongest? On the contrary, they are likely to aim for employees who know very little about cybersecurity and are not directly responsible for it. Companies can prevent this by partially decentralizing accountability and find simple ways to get staff members involved with threat monitoring. Firewalls and antivirus software are essential assets to protect data and avoid data breaches. But due to the way these applications are built, it is probable that some new forms of attacks go through the cracks. Threat intelligence practitioners look at things from a different angle, allowing to foresee dangers which may not have been accounted for by complementary security solutions. TIP provides security analysts with the functionality and tools to collect evidence-based data about hosts and spot weak security practices and anomalies. Hackers always aim to attack companies considering multiple angles, and users can work with TIP to conduct a threat intelligence analysis of their website and systems and receive a comprehensive report detailing the real-time status of 120+ parameters broken down into seven categories — IP resolutions, website analysis, SLL certificate, malware detection, WHOIS record, mail servers, and name servers. Most points under evaluation contain additional explanation to speed up and facilitate interpretation, and potential issues are marked in orange or red. Domain Reputation Scoring evaluates multiple aspects of a domain to provide a general score of one or several domain names. Analysts can use this feature as a shortcut and understand quickly whether a website is safe overall. Domain’s Infrastructure Analysis goes one step deeper in the analysis and provides data about the existing infrastructure behind a domain — i.e., IP addresses, geolocation, and subnetwork information. Cyber attacks are burgeoning and can come from anywhere, and Domain Malware Check is an efficient way to keep track of all known malware threats around the globe combining TIP’s security intelligence and major malware databases. How secure is a connection to a host likely to be? With SSL Configuration Analysis, IT security professionals can analyze how a host is configured and whether it follows best practices including valid SSL certificates, HTTPS enforcement, and hostname validation. Could someone else be the weak link and put your IP assets at risk? With the rise of SaaS applications and an increasing amount of data hosted in the cloud, organizations may want to check if vendors might be the cause of vulnerabilities. They can rely on TIP for that purpose, analyzing third-party hosts’ infrastructure. Threat intelligence approaches cybersecurity differently, enabling security analysts to take a thorough look at hosts, websites, servers, and other systems to anticipate where cybercriminals are the most likely to strike. Ultimately, it supports decision-making with evidence-based data and gives insights about where to best allocate security budgets. When Has a Client Gone Too Far?